Prepare for more knitting, murder, and mayhem with the next in the national bestselling Seaside Knitters mystery series. Autumn brings a mysterious new guest to Sea Harbor, and when she’s implicated in a crime, it’s up to the Seaside Knitters to search out a motif for murder. It’s a busy fall for Izzy Chambers Perry. Not only is she helping the Knitters make a throw to celebrate her aunt and uncle’s fortieth wedding anniversary, she’s finally selling the cottage she lived in before she got married. Luckily, newcomer Julia Ainsley wants to buy the home—although, strangely, she’s never been inside. Then on the day of the open house, a body is uncovered in the cottage’s backyard. Julia’s name and phone number, found in the victim’s pocket, instantly make her a person of interest. Soon, though, the spotlight of suspicion widens to include old friends and town leaders, as a tragic happening, long buried, slowly surfaces. Now, before the anniversary celebration can occur, the Seaside Knitters must unravel the real reason Julia has come to town—and untangle the troubled ties from the past that bind friends and townsfolk together. Sally Goldenbaum is a sometime philosophy teacher, a knitter, and an editor, and the USA Today bestselling author of more than thirty novels. 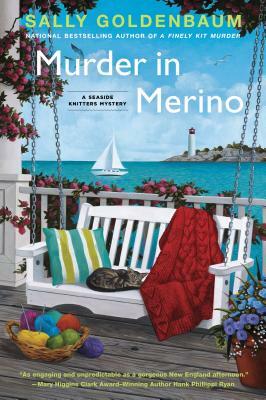 Sally became more serious about knitting with the birth of her first grandchild and the creation of the Seaside Knitters mystery series, which includes A Finely Knit Murder, Angora Alibi, A Fatal Fleece and The Wedding Shawl. Her fictional knitting friends are teaching her the intricacies of women’s friendship, the mysteries of small-town living, and the very best way to pick up dropped stitches on a lacy knit shawl.